Happiness, it's an enigma that over time philosophers, writers and thinkers have all attempted to unlock. Yet, recent findings from Harvard University have shown that positive thinking can actually influence performance and positively impact everyday life. Happiness is a universal theme that resonates with us all. Making the most of the time that we have, sharing it with those that we love and passing it onto the next generation is the foundation of happiness. Everyone has heard that little voice inside their head asking: “Is that really what you want?” It's the same voice that encourages us to take the road less traveled and go for what is best for us. Whether loud or soft, always listen to the voice in your heart. Everything happens for a reason. Behind each action is an emotion that brings meaning to what we do. Let's make each action a declaration and a reminder that “I act because I think about the world around me”. Because happiness starts with yourself and because everyone needs time for themselves, take a moment to read, write, walk, swim, run, go out, discover new things, grow and develop, or simply think. Happiness has no meaning unless it's shared. Happiness grows when we’re in contact with friends, family and acquaintances. It gets stronger whenever we meet someone new. A simple smile can brighten someone’s day. Each day is to be treasured. Just think of how many places you can visit in 24 hours, how many people you can meet and how many friendships you can build. A single moment can change everything, as long as you know to seize it. Happiness is a journey, not a destination. Each new day has the potential to be the best day of your life. With all that as a guiding light, Lancôme is dedicating itself to putting more joy as well as radiant skin into each day with our iconic heroes – Advanced Genifique, Absolue, Renergie, L’Absolu Rouge, La Vie Est Belle and many more bespoke beauty routines for every woman. The beautiful Journey to Happiness with Lancome runs from 19 – 25 March with supporting partners; Naelofar Hijab, Häagen-Dazs and Nescafe. 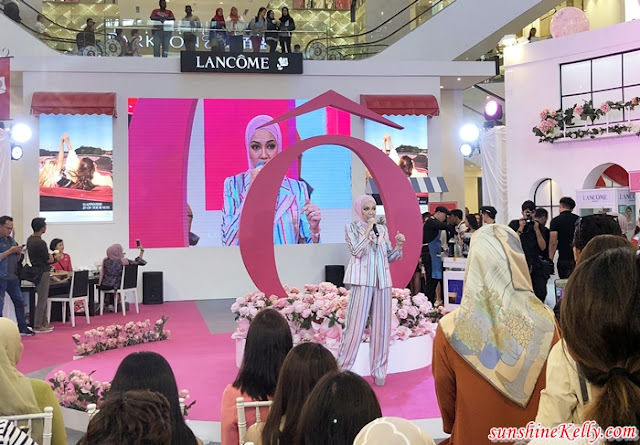 Neelofa who signed with Lancôme exclusively since September last year collaborates to reward fans with Be Lofa Turbans with any purchase of her favourite Lancôme products throughout the 1-week event. Her favourites consist of the Advanced Genifique for radiant glowing complexion, Teint idole Ultra Wear Foundation that gives 24 hours velvety matte coverage, L’Absolu Rouge with colours that speak out via three difference finishing and over a selection of 50 shades and lastly the fragrance of Happiness - La Vie Est Belle.